One afternoon I was looking out a window and noticed a small speck of dirt on the glass. I discovered if I closed one eye and positioned the speck over the shadow side of a distant tree the speck looked white. If I moved so the speck was positioned over the light part of the tree the speck looked black. Obviously, the value of the speck was not changing. The speck looked different because of changing contrast. For me, this experience very powerfully demonstrated, once and for all, the relativity of value. The phenomenon also suggested a way to devise a grayscale that would be more accurate and easier to use than some I had previously used. I salvaged a piece of plastic from a discarded package and cut it into a rectangle. Along one edge I painted a series of dots using the seven grayscale acrylic pigments made by Golden Acrylics, plus black and white. I painted the dots starting with black on the left, then value number two, then value number three, and so on, finishing the series with a white dot on the very right. I then numbered the nine dots from one to nine. 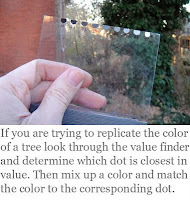 Just like the gray speck on the window I use these dots to identify exact values. As long as the light source is identical on the grayscale and the color you are evaluating your judgment of values will be extremely accurate. Why is the ability to paint accurate value so important? Strong, discrete value zones are essential to create the pattern necessary for strong composition. Early in my painting career I tended to force values into the very dark and the very light, neglecting the subtle and beautiful intermediate values. I got this habit from practicing the art of the woodcut in which I thought in terms of black and white. Others tend to use only the middle values neglecting the deep darks and brilliant lights that give depth. I have heard the claim that the eye can only differentiate from nine to ten different values. Ansell Adams effectively used a value system where he forced the nearly infinite values of black-and-white photography into only ten values. He developed this theory by observing the more discrete values of landscape painting. John F. Carlson, in his famous book on landscape painting, advocates a similar idea but suggests limiting values to four or five. By using nine values I can force the values into sets of two or three and still maintain the broad patterns advocated by Carlson, or I can use the entire nine for a more full value, tonalist effect. I find that having nine values on one grayscale gives me more control which is absolutely necessary in the high-wire-act of thick painting. I just found your blog. This is brilliant. Thank you for taking the time to explain how to paint thickly. You're very welcome Jeremy. Thanks for dropping by. I'm glad to find other thick paint enthusiasts. More to come, of course, so I hope to hear from you again. Hi, I've also just found your blog through Gurney Journey. Thanks for taking the time to make these great posts. I'll be visiting often! A great blog indeed, I was however a bit to fast commenting, ... sorry for that. No problem René. I want the comments section to be as informal as possible. The main thing is to encourage the sharing of ideas.